Does FaceBook confuse you? Are you wondering why so few people are seeing your posts? Here’s a few quick tips to help you learn how to leverage Facebook and use it to Build Your Brand. 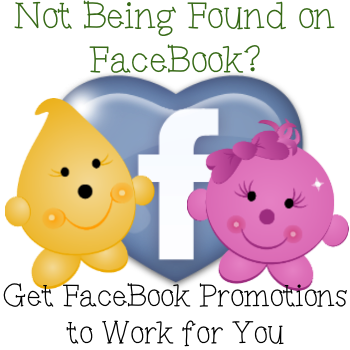 See what’s holding you back and how to get FaceBook promotions to work for you and boost your edge rank on FaceBook. Why Are My FaceBook Fans Ignoring Me? I’ve been asked this by many people and there’s usually a good reason why you feel like you are being ignored. First you need to understand unless you do a “sponsored story” or a “promoted post” that only 20-25% of your fans will see your posts. But there are a few “tweaks” that you can make to get your page to show up in more of your fans’ feed. 1: Post a maximum of 2 times per day. “But Katie,” you say, “I have a million things I want to share!” So does the rest of the world my sweet … however, sharing multiple stories, images, posts, and shares more than 3 times a day is destroying your edge rank! If you are sharing more than 2 times a day on FaceBook, you need to discover other sources to share your content, like Twitter or Pinterest! Twitter is my new favorite – why? Because you can share dozens of posts a day and no one gets offended, unless you’re spamming. Don’t spam and don’t miss my post on how to tweet effectively. I know, I know … you have so much you want to share. But here’s the catch your first post is the one that will get the most attention and after that they lose their edge rank. So what does this mean? If you post or share content 3 times a day, make sure they are at least 5 hours apart for the best exposure and the best free facebook promotions available to your page. For some strange reason, right now FaceBook is giving posts with more words an extra boost in edge rank. So rather than typing up a quick one sentence update or post on your facebook page, put some thought into your content and post 4-5 well thought out, well stated sentences that will be sure to garnish those facebook promotions that you are dying to receive! People love images! And the truth is that more people share images than those who share status updates. So the moral of the story, share some photos. Share pictures of your new releases, studio work, custom orders, progression of a new piece you’re working on. It doesn’t matter what the image is, just be sure to share it. FaceBook wants you on their site and for that reason FaceBook promotions get more value and higher weight in the Facebook algorithm if they are posted on the site as opposed to being sent or scheduled from a third party site, like HootSuite. So the moral of the story: log onto the site and do all your FaceBook promotions right there on your page. You can even schedule status updates far into the future now – so there’s no reason NOT to do it all on FaceBook. For whatever reason your FaceBook promotions that contain links to any URL are losing ground in FaceBook’s algorithm. I personally think that this stinks, because now when someone shares my content, the link of where to find that content is often missing. This is not helping me get found outside of FaceBook. So here’s my two cents on the matter, while it is best NOT to post links to other URLs on your FaceBook promotions, if you are sharing something that you think is valuable and has the potential to be shared or to even go viral, put the link in there and take the chance. Remember that the majority of people go to FaceBook to be social, not to shop. This means that YOU and your brand have GOT to be social. Ask people what they are doing. Tell your fans about the weather. Be real, be yourself, but remember that in the midst of your self promotion, you must be social or this social network (called Facebook) will ignore your posts and promotions so fast that you will wonder why you are spending time there to begin with. Make sure that you are interacting as your page as well. “Like” other pages from yours and comment on their content. That is truly the quickest way to grow followers and your fan base. Please know that when commenting as your page, you are Building Your Brand as well as your reputation. So, be sure that you are kind, polite, considerate, and true to what your business stands for. Hopefully these FaceBook promotions tips will help you to Build Your Brand on Etsy. Remember that you want to share content that is relevant to you and to your page. If you don’t your fans are likely to leave, ignore you, refuse to share or like your content, or worse they could ignore or block you (oh the horror)! Need an Etsy Store MakeOver and You’re Not Sure Where to Start? Let this workbook be your guide! My posts with photos get less views, I can’t get my fans to be interactive. I ask questions and hardly anyone responds. Not sure what else to try. Thanks for the tips. great tips for facebook Katie, have a question, when making posts is it better to do it from your business page or your main page? I struggle with this a lot. It won’t let me like others pages or things if I am signed on in my business page so always having to switch back and forth and that is a pain. Would love to start utilizing Face book but not sure how. Thanks for your great articles and tips they are so helpful.